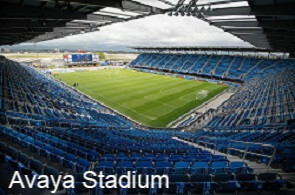 Avaya Stadium (capacity: 18,000) is currently under construction on Coleman Ave. adjacent to the San Jose International Airport. The European-inspired building is expected to be the first cloud-enabled venue in Major League Soccer and will be among the most technologically advanced stadiums in the world. The stadium features a canopy roof and the steepest-raked seating in Major League Soccer to provide the best possible fan experience. Additionally, the north end zone houses the largest outdoor bar in North America, a two-acre fan zone and a double-sided video scoreboard. The suites and club seats are located at field level, giving fans a premium experience unlike any other in professional sports. © 2019, L.E.T. Group, Inc. All Rights Reserved.